I want to start working out at home, but I can't exactly afford a home gym. Any budget-friendly equipment you'd recommend? Thanks! If you thought a jump rope was just for the playground, think again. You can get a great cardio workout from this little piece of equipment. This one is adjustable, so you can share it with your family and avoid tripping over excess length. According to the Jump Rope Institute -- yup, that's a real thing -- just five minutes a day of jumping can improve your physical health. Who doesn't have time for that? Jump to it! Don't be intimidated by weights! The trick is to stock up on a few different sizes, so you can make adjustments based on the muscles you're working. For example, use a heavier set for bicep curls and a lighter set for your triceps. Weights aren't just for building muscle... 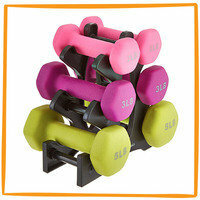 Using these will really amp up your calorie burning! Sometimes I'll hold onto a light pair of dumbbells while I Housewalk. Try it! This three-size set is awesome (not to mention, cute) and even includes a handy stand. 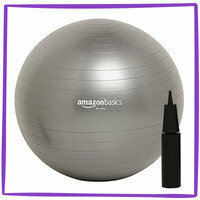 This jumbo exercise ball is great for stability and balance. 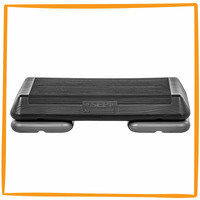 The 65-cm version is good for most heights; you'll be able to sit on it and easily rest your feet on the floor. Lie back on it for crunches, sit on it while lifting weights and, best of all, use it as a desk chair to burn extra calories while you work! I love that this ball comes with an easy-to-use pump, so you can easily adjust the firmness. 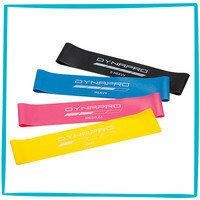 These stretchy bands allow you to perform so many different types of exercises anywhere. They're portable and hardly take up any room! (Hello, travel companion.) This four-pack is perfect, because it lets you adjust the intensity of your workout as you go. Start with the light band, and work your way up! Just loop a band over your arms or legs, and let the resistance do its thing. Trust me... You'll feel the burn! Does this aerobic platform remind you of leg warmers and big hair? It was big in the '80s, but it's still relevant today! Use the elevated platform for both strength exercises, like lunges and inclined push-ups, as well as for cardio (yes, like step aerobics). This one includes a pair of risers, so you can vary the height and intensity. Put on your favorite '80s tunes, and get steppin'! HG Heads Up: As with any workout routine, trust your body, and exercise at your own risk. When in doubt, consult a doctor or fitness expert. January is National Wheat Bread Month. Have you tried the thin-sliced varieties by Dave's Killer Bread? So yummy, organic, and just 60 - 70 calories per slice. 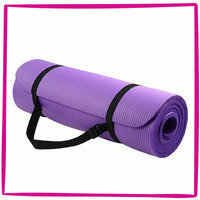 Who couldn't use advice on budget-friendly workout gear? Click "Send to a Friend" ASAP!